Take control of your business energy with latest generation of SMETS2 smart meters now available. Smart meters allow you to get on with the day-to-day running of your business. They do all the hard work, providing accurate readings each month so you only pay for the energy you use. In line with the Government’s commitment to ensuring that every small business is offered a smart meter by the end of 2020, we’re installing the latest generation SMETS2 Smart Meters. Register your interest to see if you qualify. Smart meters are more sophisticated than traditional meters as they provide more information on your energy usage to both you and your energy supplier, quickly and conveniently for your business. Install the latest generation SMETS2 smart meters to help your business share accurate information about your energy usage for accurate and simple billing. See real time information on your energy consumption and exactly how much energy you’re using in pounds and pence with an optional portable display unit. Smart meters are helping businesses become more energy efficient. By installing one in your business, you’ll gain a better understanding of how you use your energy. They allow you to keep track your energy usage patterns and allow access to more detailed reports, giving you an idea of how you’re using your energy and how you can reduce your consumption. Your meter readings are automatically sent to your supplier via a safe and secure national network set up solely for smart meters (the Data Communications Company or DCC). Although they use a wireless system, it doesn’t use your Wi-Fi connection. WHAT HAPPENS IF I SWITCH SUPPLIER? If you’re a small business with a single phase or U6 gas meter, get in touch today. Please note that if you already have a half-hourly meter, you will not be eligible. WILL I STILL RECEIVE BILLS? 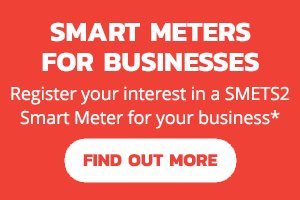 Find out if your business is eligible for a smart meter, how you can get started and what to expect to get your business running smarter. Smart meters are available to small businesses with a single phase meter or a U6 gas meter onsite. Please note that if you already have a half-hourly meter, you will not be eligible. Call us on 0115 975 8258, register your interest online or email smartmeters@yuenergy.co.uk. We’re on hand to help with any questions. We'll supply you with a quote and the option to have a smart portable display unit to see real time information on your energy consumption. Your smart meter will be installed at a time that suitable and has minimum impact for you and your business. Keep track and of and reduce your energy consumption so you only pay for the energy you actually use. WHY SWITCH TO A SMART METER? Find out how small businesses can benefit from Smart Meter technology.